In how many ways exactly can the olives and the olive oil be used? Let's begin with the most obvious one: food. Even in prehistoric times, the olive was well known as a food. In early societies there was not the knowledge regarding the processing or the soaking of olives; the olive was merely seen as a seasonal type of food. This means that olives were only consumed during the period when they ripened and became edible. As the time passed, the inhabitants of the Mediterranean areas looked upon the olive as an essential part of their diet, so they realized they had to develop a method of keeping olives for a long period of time after the point of harvesting. Several forms of soaking and preservation were developed. For several centuries, a basic ingredient used in the preservation of olives was salt and as additional ingredients they used honey, olive oil, vinegar and vine juice. Aromatic plants were used as preservers but also as a way of improving the flavor of the oil. Ancient techniques of soaking the bitterness out of the olives survived for many centuries. Some of these methods are still used today. 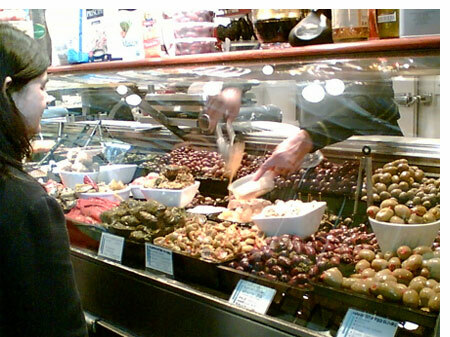 The farming population has hardly modernized the production of edible olives. Today, the Cretan diet is believed to be the best example of a Mediterranean diet and researchers have discovered that the Cretans have the lowest rate of heart diseases and cancer. The Cretans' good health is thought to be due to their diet. Guess what. 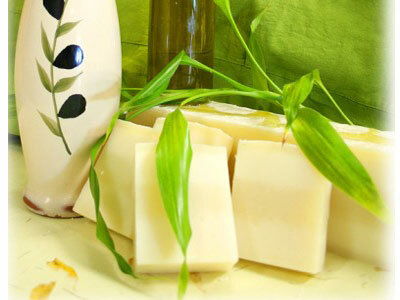 The largest role in the Cretan diet is played by olive oil. 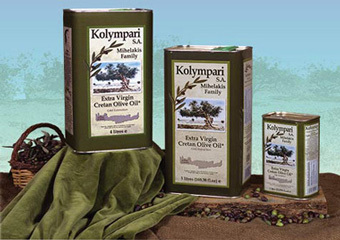 The Cretans (like the Greeks as a nation generally) are learned in olive oil. 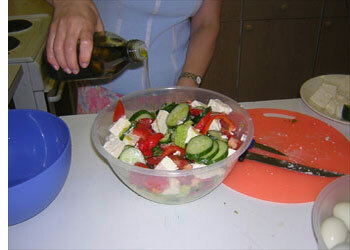 A foreign visitor usually has the impression that Cretans food literally floats in olive oil. Any other form of fat is only occasionally used. They give it to their children on bread; they use it with all greens, even with meat and fish. Half of every salad is olive oil. They even cook pork in olive oil. Research has shown that every Cretan family consumes about 350 liters per year! 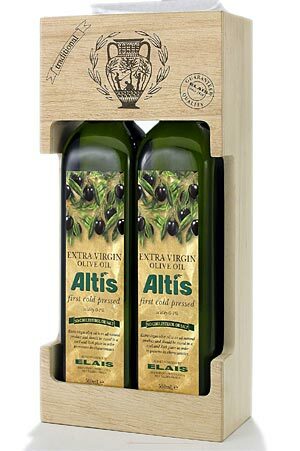 Since prehistoric times olive oil has been used for the lighting of houses and public buildings. The use of olive oil as lighting material has even created a range of symbols in that olive oil is seen as a source of light. In evening ceremonies that required lighting, the role of olive oil was considered sacred, as it still is in present day's worship. According to Herodotus (5th c BC), there was a special celebration in Egypt which was known as "lychnokajia" (lighting of the lamps). All people lit their lamps and it was a spectacular event. 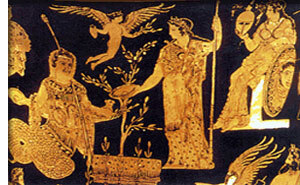 In Byzantine times, olive oil was essential for the "lychnokajia" in the monasteries and the churches. Up until the first decades of this century, the farming population of Greece had olive oil as their basic fuel for lighting. Aelianus, a writer from the 3rd century AD, claimed that olive oil and the olive tree flowers were medicines that could be used even on elephants so as to pull out arrows if hunters had succeeded in hitting them. It's a well known fact that olive oil was believed to be a cure for all wounds and this knowledge continued in folklore medicine for many centuries. Doctors in ancient times and in the Byzantine world mention an array of prescriptions that use olive oil as a basic ingredient. 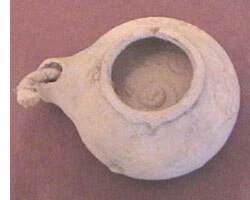 It was mainly used against fever by being rubbed onto the body of the person who had a temperature. It was also used as a neurological medicine. Many doctors in ancient times recommended bathing in lukewarm olive oil for those who suffered from neuralgia. The ancient prescriptions which use olive oil as a basic ingredient are more than numerous. 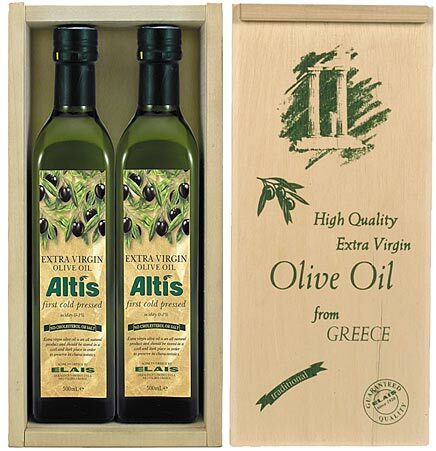 In general we could say there were hardly any illnesses that could not be cured with olive oil. It was used against poisoning, for oral health and in keeping teeth white, against stomach problems, dermatitis and leprosy, which was a disease that continually appeared in the sub-tropical areas up until quite recently. The best oil for therapeutic reasons was the oil taken from the oil lamps of the icons. Folklore medicine used olive oil as an aphrodisiac. 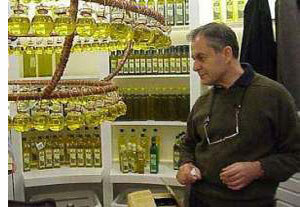 There is a saying that is repeated in many olive oil producing areas of Greece: "use olive oil and come at night". This echoes folklore ideas. 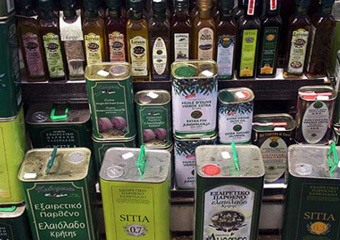 In Crete, olive oil which had not been cooked was deemed to be a much more effective aphrodisiac, especially if the oil came from the wild varieties of olive trees. This belief was what led to this custom: many newlyweds had to eat bread soaked in the first olive oil of the year. See, it was thought to be an elixir for conception in the south of Crete.